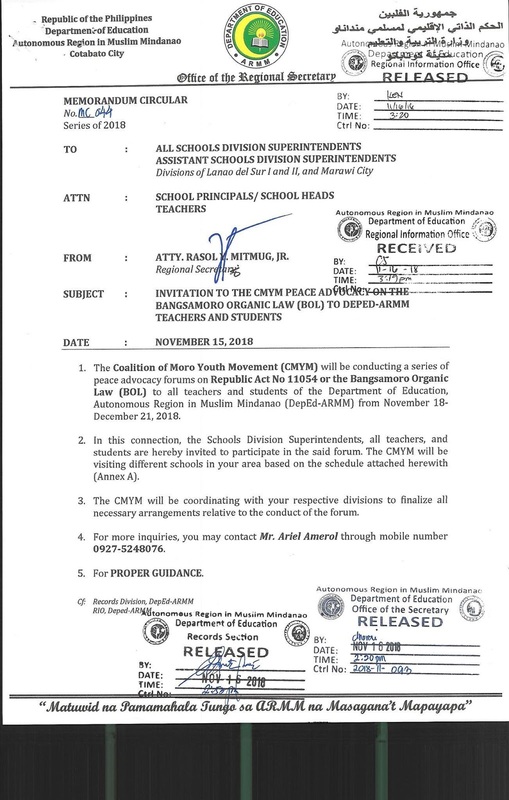 PASIG CITY, December 21, 2018 – The Department of Education (DepEd) reminds all public and private Kindergarten, elementary, and secondary schools of the necessity and importance of adopting and enforcing anti-bullying policies in their respective institutions. 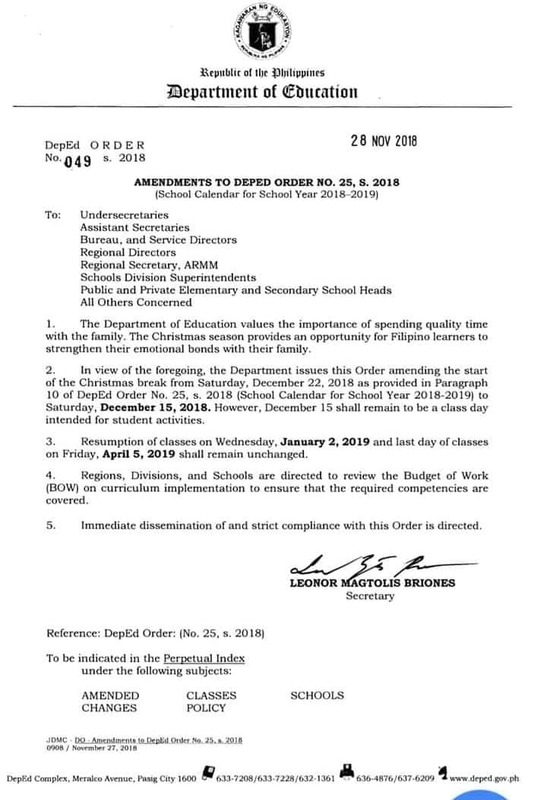 DepEd Order No. 55, series 2013, or the “Implementing Rules and Regulations (IRR) of Republic Act No. 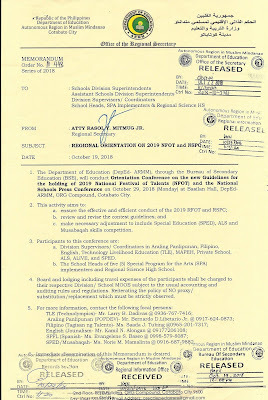 10627 (R.A. 10627) Otherwise Known as the Anti-Bullying Act of 2013,” on the other hand requires all public and private schools to submit a copy of their child protection or anti-bullying policy to the Division Office within six months from the effectivity of the IRR. 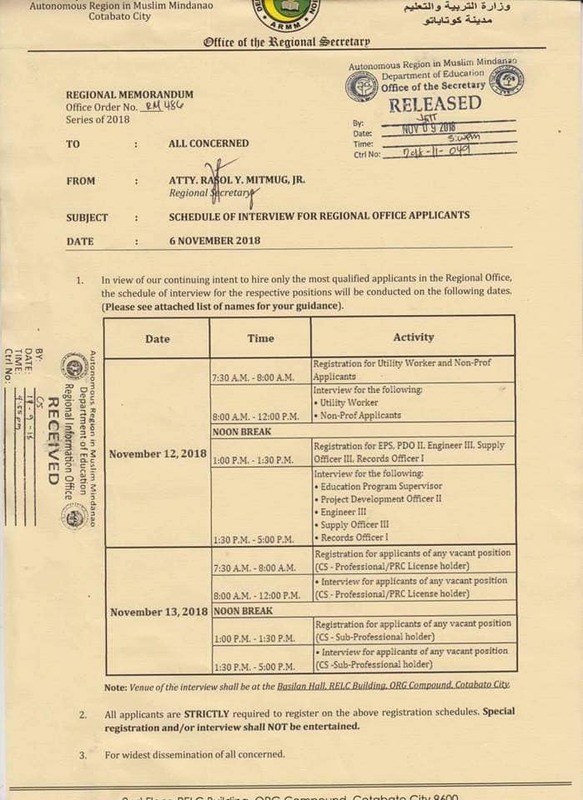 The same shall be submitted to the Regional Director in addition to the requirements for an application for permit to operate and/or recognition as prescribed by the existing rules of the Department. 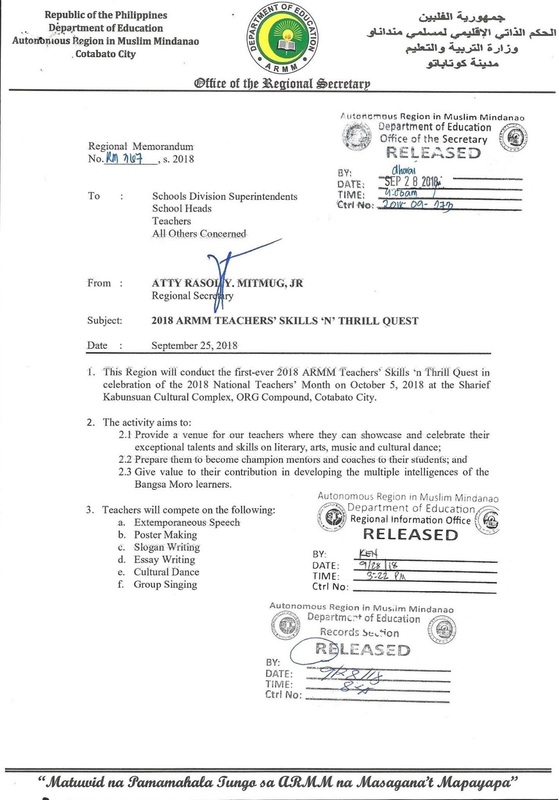 Rule IV of DO 55 s. 2013 underscores that the bullying prevention program in schools shall be comprehensive, multifaceted and shall involve all education stakeholders and personnel. Schools shall develop intervention strategies like counseling, life skills training, education and other activities that will enhance the psychological, emotional and psycho social well-being of victims, bullies and other parties who maybe affected by the bullying incident. 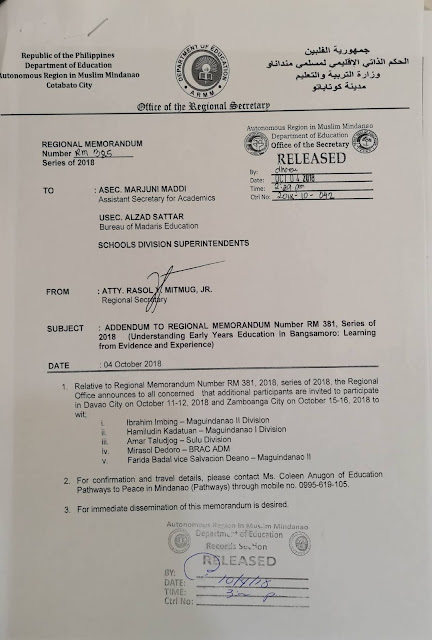 Private schools that fail to comply with the requirements of R.A. 10627 or of the IRR may face penalties under the law. The Department also encourages learners who experience or witness bullying, abuse, or retaliation to speak up and report verified incidents to their peers, parents, teachers, and the appropriate authorities for proper intervention. 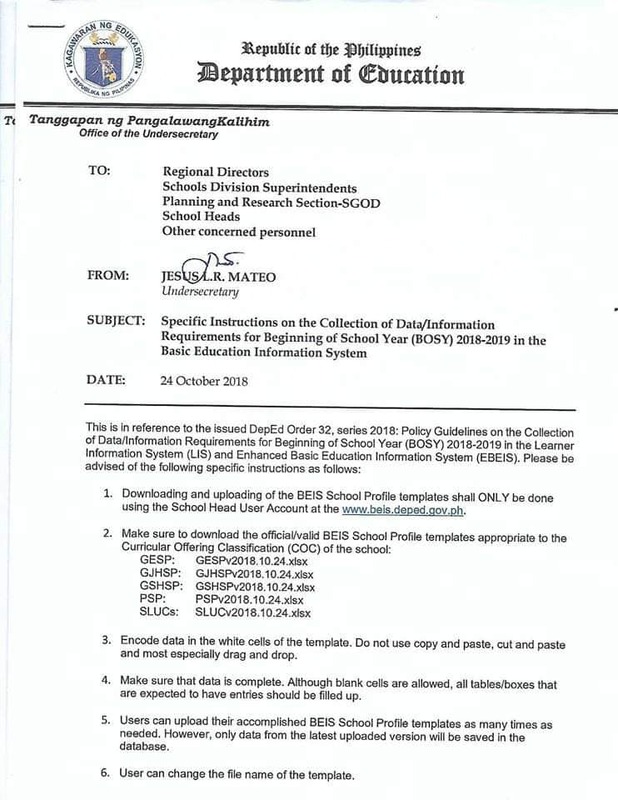 Any information relating to the identity and personal circumstances of the bully/ies, the victim/s, or the witness/es shall be treated with utmost confidentiality by the CPC and the school personnel. 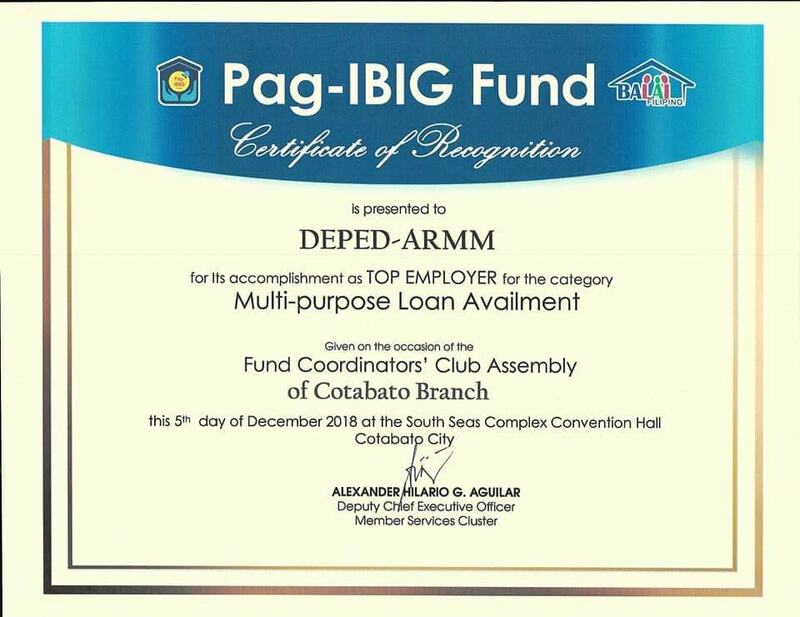 CONGRATULATIONS DEPED-ARMM for the distinction as a RED ORCHID HALL OF FAME AWARDEE having garnered a total of 100% based on the Department of Health's set criteria for implementing a 100% Tobacco-Free Environment and following the World Health Organization's "MPOWER" Framework. 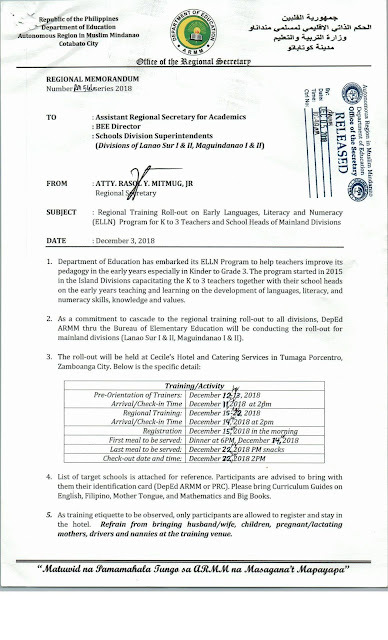 DepEd has embarked its ELLN Program to help teachers improve its pedagogy in the early years especially in Kinder to Grade 3. As a commitment to cascade to the regional training roll-out to all divisions, DepEd-ARMM thru the Bureau of Elementary Education will be conducting the roll-out for mainland divisions (Lanao Sur I and II, Maguindanao I and II). 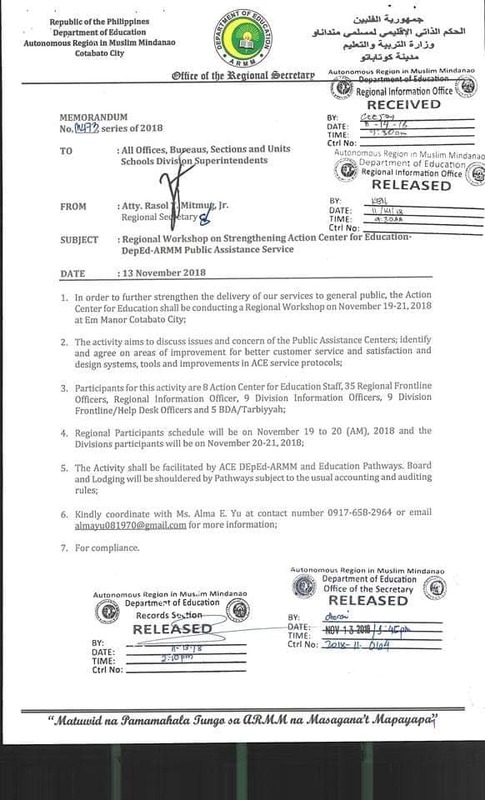 Please see Regional Memorandum No. 566 s. 2018 for further details. 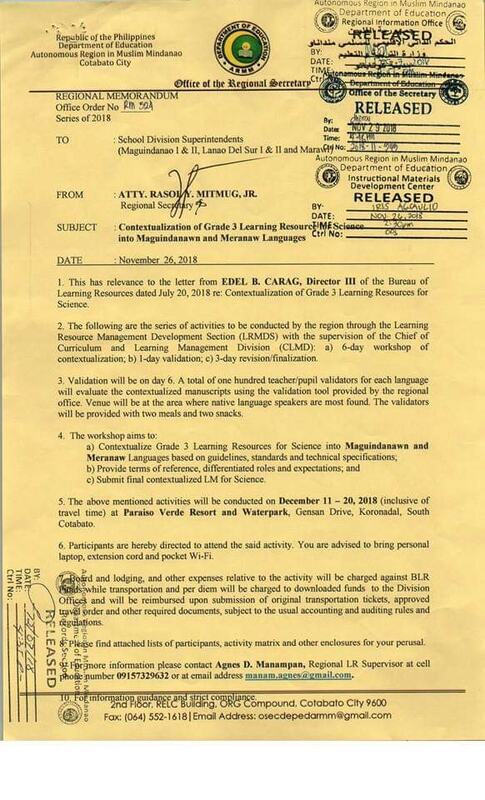 This has relevance to the letter from Edel B. Carag , Director III of the Bureau of Learning Resources dated July 20, 2018 re: Contextualization of Grade 3 Learning Resources for Science. 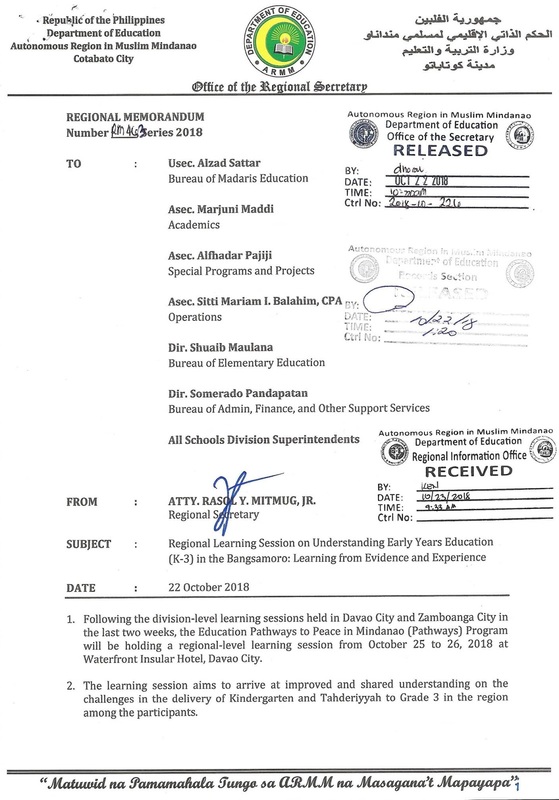 The following are the series of activities to be conducted by the region through the Learning Resource Management Development Section with the supervision of the Chief of Curriculum and Learning Management Division. 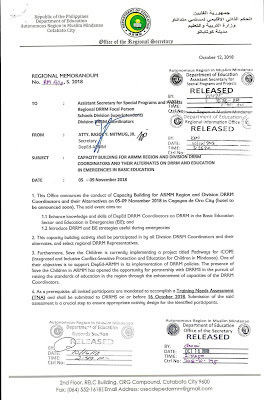 Please see Regional Memorandum No. 324 s. 2018 for more details. 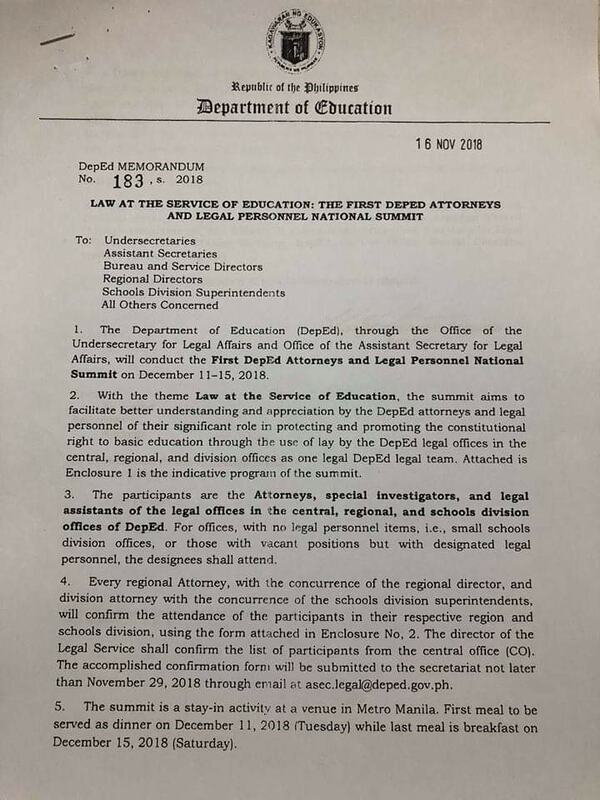 The DepEd, through the Office of the Undersecretary for Legal Affairs and Office of the Assistant Secretary for Legal Affairs, will conduct the First DepEd Attorneys and Legal Personnel National Summit on December 11-15, 2018. 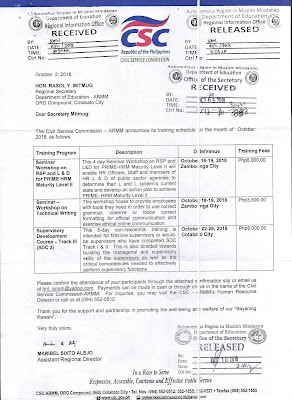 Please see DepEd Memorandum No. 183 s. 2018 for further details. 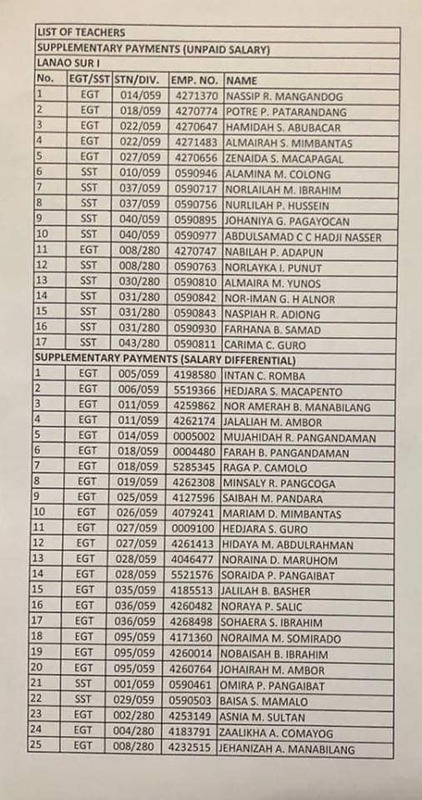 Attached are list of names of the qualified applicants for Maguindanao II Division. 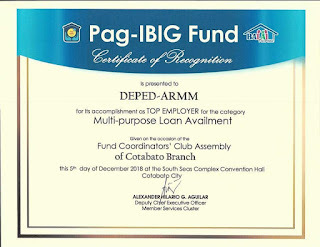 The following personnel listed on the attached photos are advised to visit the Cash Division of DepEd-ARMM Regional Office, Ground floor RELC Bldg. ORG Compound, Cotabato City on December 5, 2018 (Wednesday) from 8:00 AM to 12 Noon only. 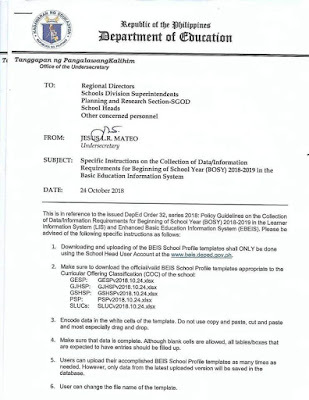 This is in reference to the issued DepEd Order 32, series 2018: Policy Guideline on the Collection of Data/Information Requirements for the Beginning of School Year (BOSY) 2018-2019 in the Learner Information System (LIS) and Enhanced Basic Education Information System (EBEIS). 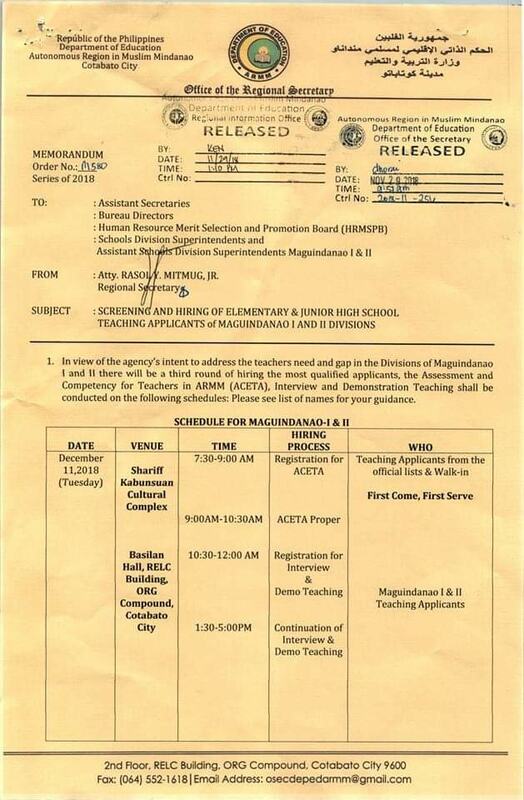 Please be advised of the specific instructions written in the attached memorandum. The DepEd-ARMM continues its mission to provide quality education by hiring the most competent teacher-applicants. 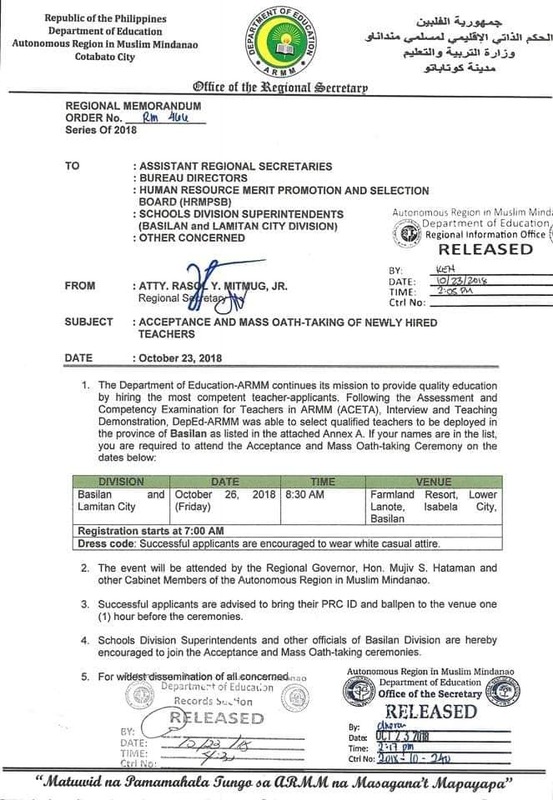 Following the Assessment and Competency Examination for Teachers in ARMM (ACETA), Interview and Teaching Demonstration, DepEd-ARMM was able to select qualified teachers to be deployed in the province of Basilan. 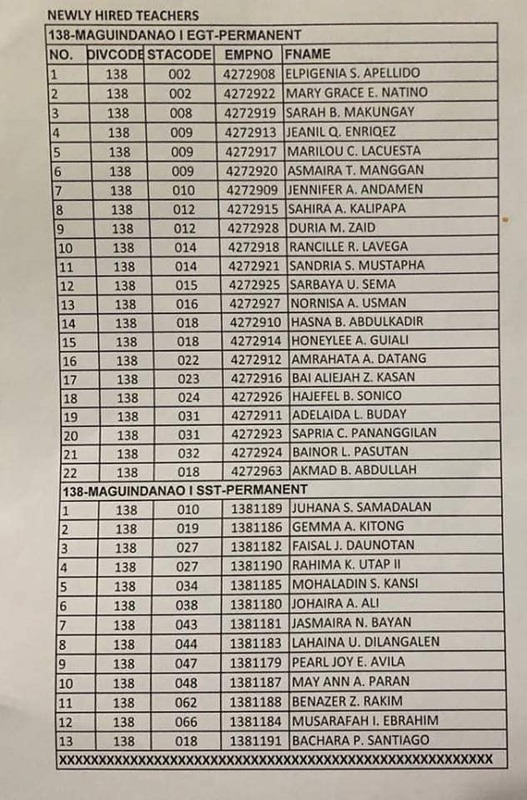 Attached are list of the successful applicants for the division of Basilan and Lamitan City who are required to attend the Acceptance and Mass-Oath Taking Ceremony. 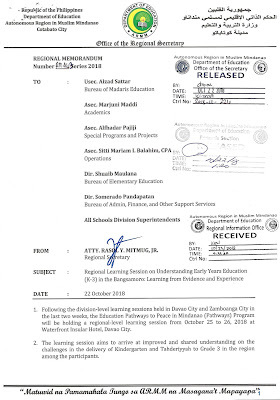 Please see Regional Memorandum Order No. 466 series of 2018 for the schedule and venue of the ceremony. 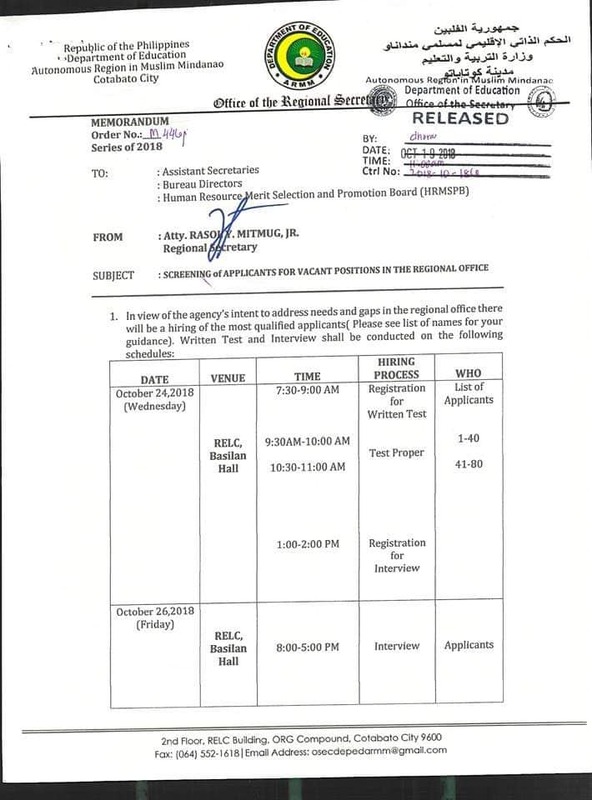 Applicants are advised to bring photocopy of their IDs, preferably PRC IDs. 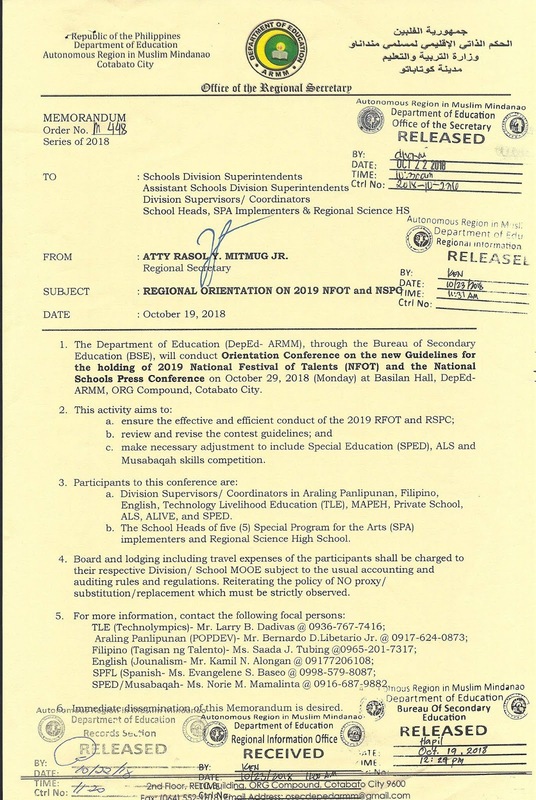 The DepEd-ARMM, through the Bureau of Secondary Education (BSE), will conduct Orientation Conference on the new Guidelines for holding of 2019 National Festival of Talents (NFOT) and the National Schools Press Conference on Monday, October 29, 2018 at Basilan Hall, DepEd-ARMM, ORG Compound Cotabato City. 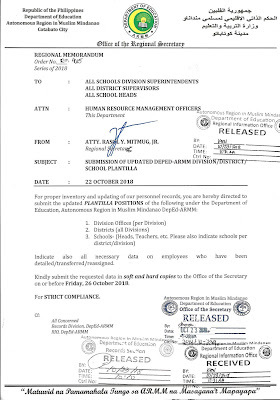 Please see Memorandum Order No. 448 series of 2018 for further details. 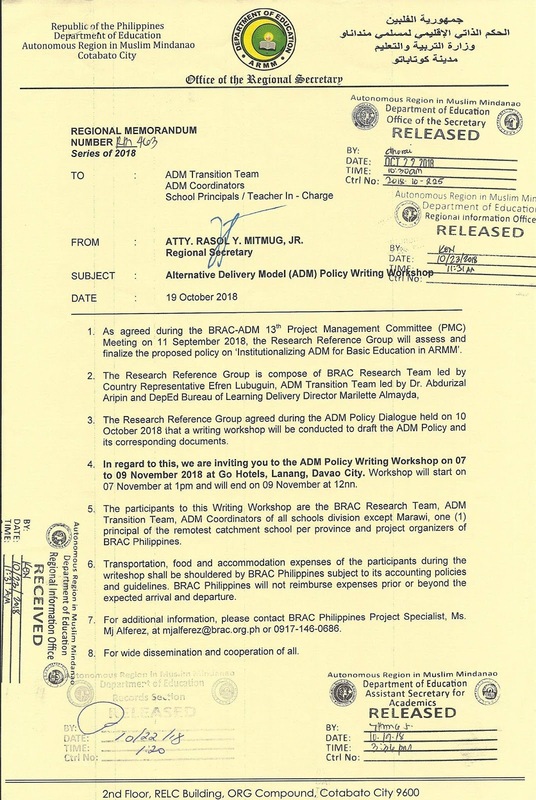 As agreed during the BRAC-ADM 13th Project Management Committee (PMC) Meeting on September 11, 2018, the Research Reference Group will assess and finalize the proposed policy on 'Institutionalizing ADM for Basic Education in ARMM'. 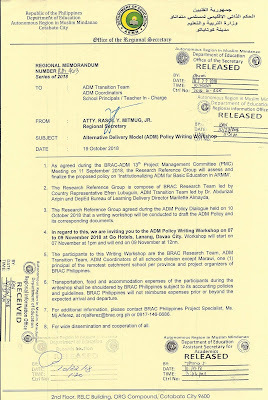 In regards to this, we are inviting you to the ADM Policy Writing Workshop on November 07-09 2018 at Go Hotels, Lanang, Davao City. 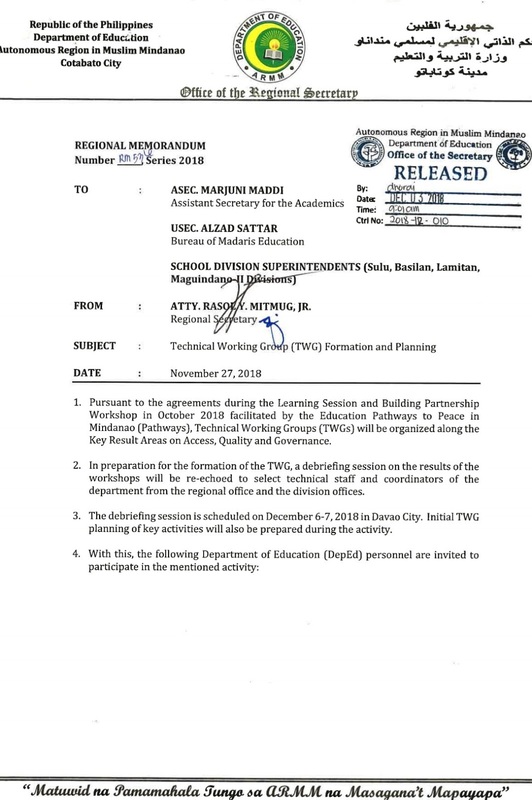 Workshop will start on November 07 at 1PM and will end on November 09 at 12NN. 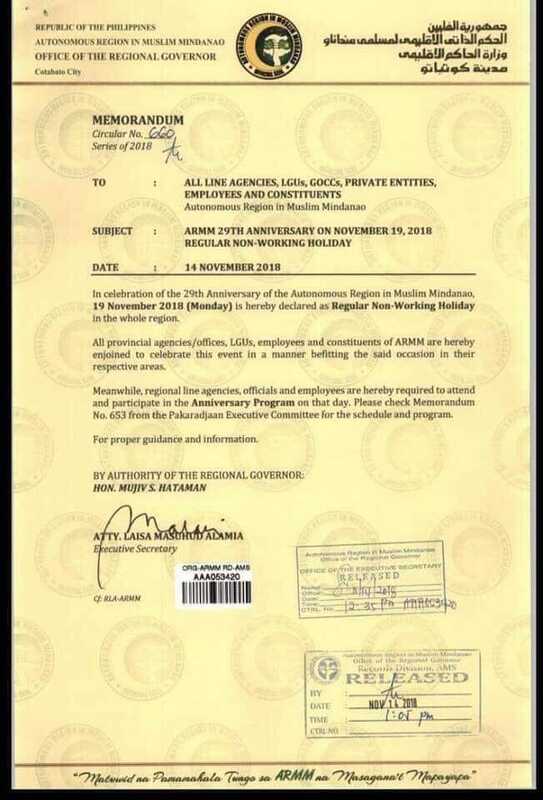 Please see Regional Memorandum No. 463 series of 2018 for further details. 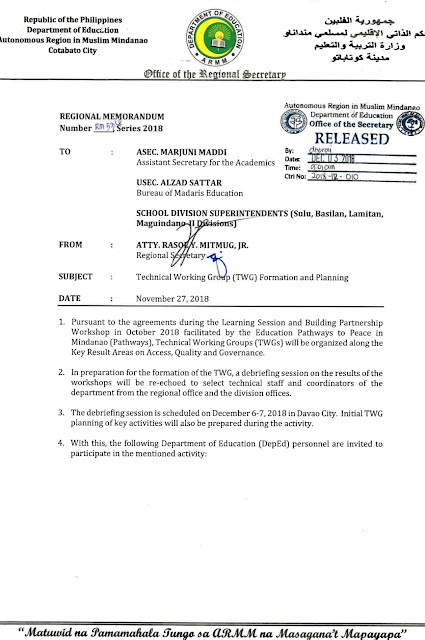 Following the division-level learning seesions held in Davao City amd Zamboanga City in the last two weeks, the Education Pathways to Mindanao (Pathways) Program will be holding a regional-level learning session from October 25 to 26, 2018 at Waterfront Insular Hotel, Davao City. 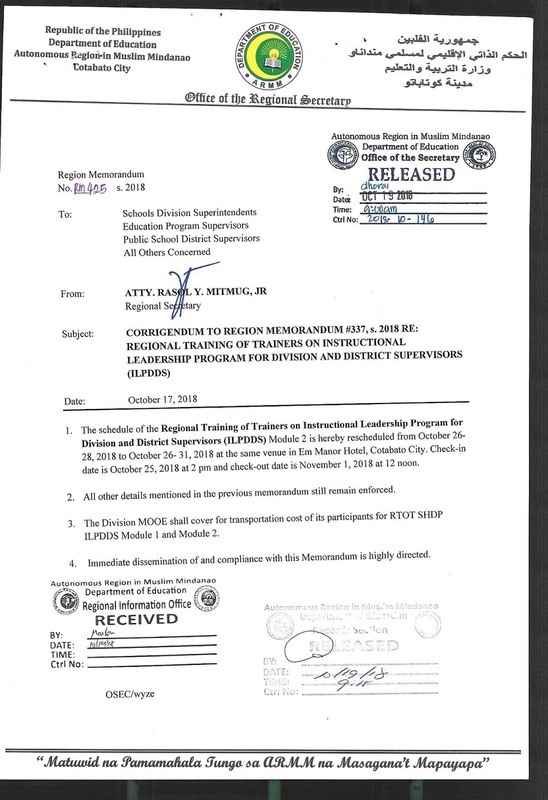 The schedule of the Regional Training of Trainers on Instructional Leadership Program for Division and District Supervisors (ILPDDS) Module 2 is hereby rescheduled from October 26-28, 2018 to October 26-31, 2018 at the same venue in Em Manor Hotel, Cotabato City. Please see Regional Memorandum No. 425 series of 2018 for further details. 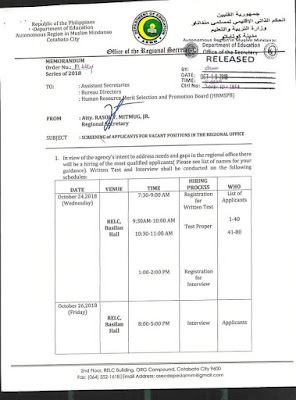 In view of the agency's intent to address needs and gaps in the regional office, there will be a hiring of the most qualified applicants. 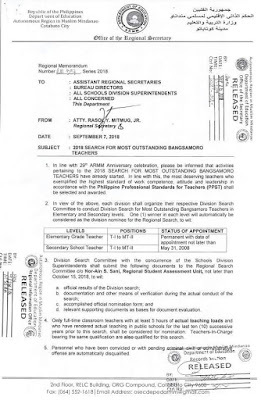 Attached are the list of the qualified applicants. Please see Memorandum Order No. 446 Series of 2018 for the schedule and venue of the Written Test and Interview. 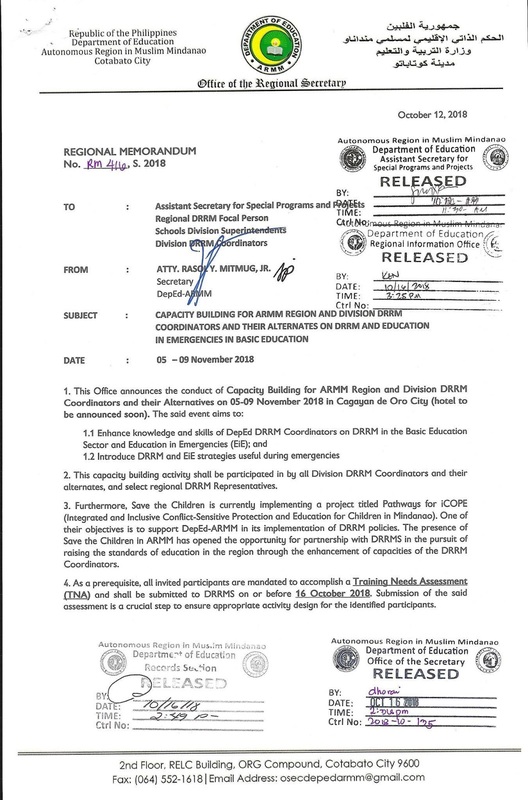 The DepEd-ARMM's Office of the Regional Secretary announces the conduct of Capacity Building for ARMM Regiona and Division DRRM Coordinators and their Alternatives on November 5-9, 2018 in Cagayan de Oro City (hotel to be announced soon). 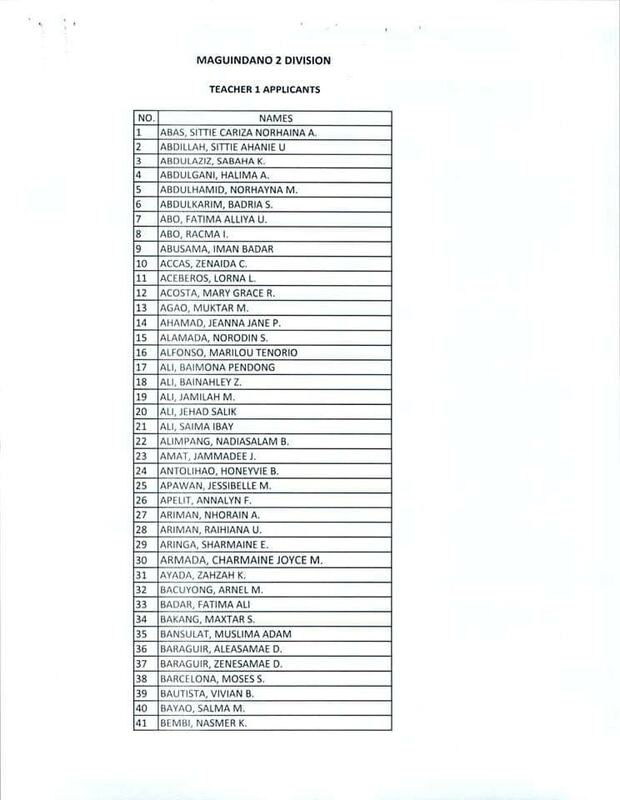 Attached is the list of Division/Region/Office and participants. 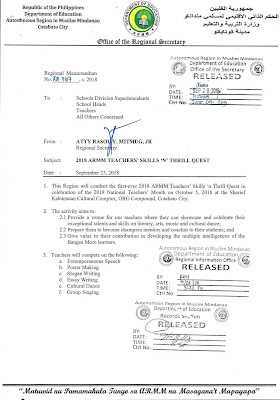 Please see Regional Memorandum No. 416 Series of 2018 for more details. 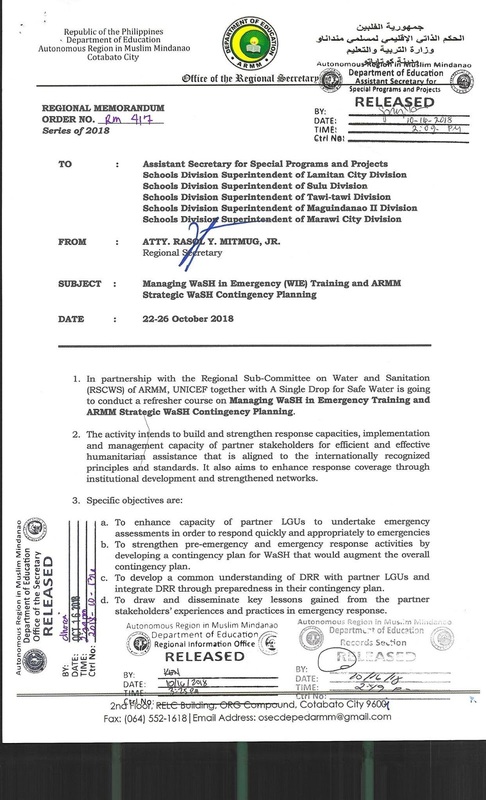 In partnership with the Regional Sub-Committee on Water and Sanitation (RSCWS) of ARMM, UNICEF together with A Single Drop for Safe Water is going to conduct a refresher course on Managing WaSH in Emergency Training and ARMM Strategic WaSH Contingency Planning. 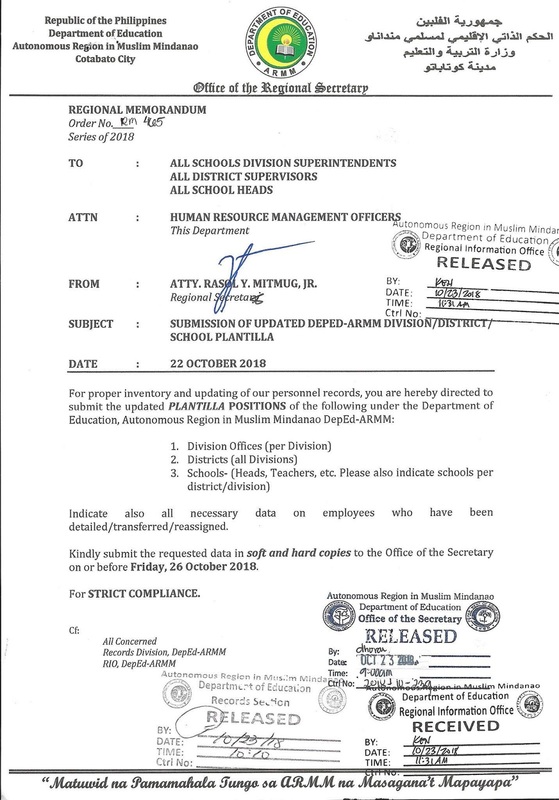 Please see Regional Memorandum Order No. 417 Series of 2018 for further details. 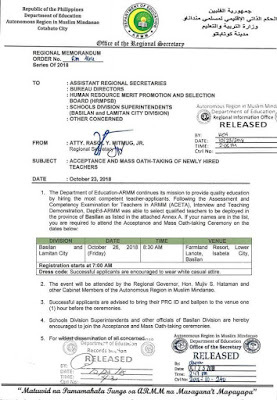 All heads and employees of offices, bureaus, and units, all Schools Division Superintendents, and other partner agencies of DepEd-ARMM are hereby encouraged/invited to attend the forum entitled : “Ensuring smooth transition from ARMM to BARMM, strengthening inclusivity and reform in governance in the Bangsamoro Autonomous Region”, A Dialogue with the ARMM ion the Republic Act No. 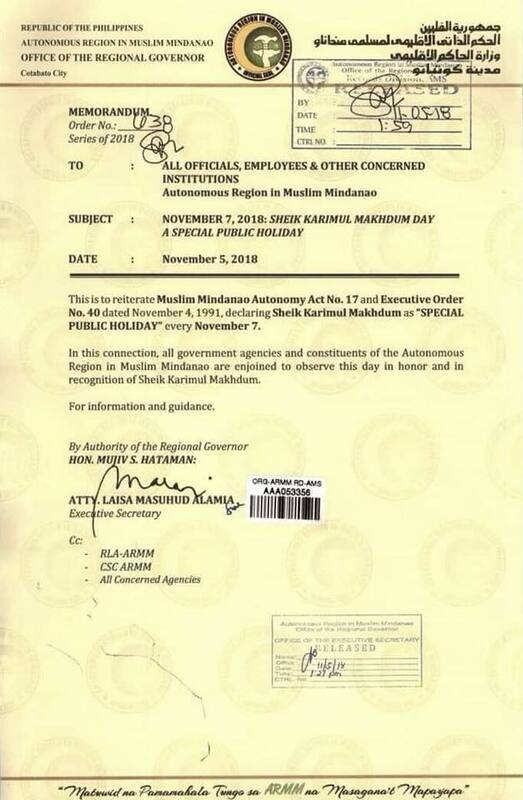 11054 otherwise known as the Bangsamoro Organic Law. The forum will be conducted today, October 17, 2018 at 1:30PM at the Shariff kabunsuan Cultural Complex, ARMM Coumpound, Cotabato City. 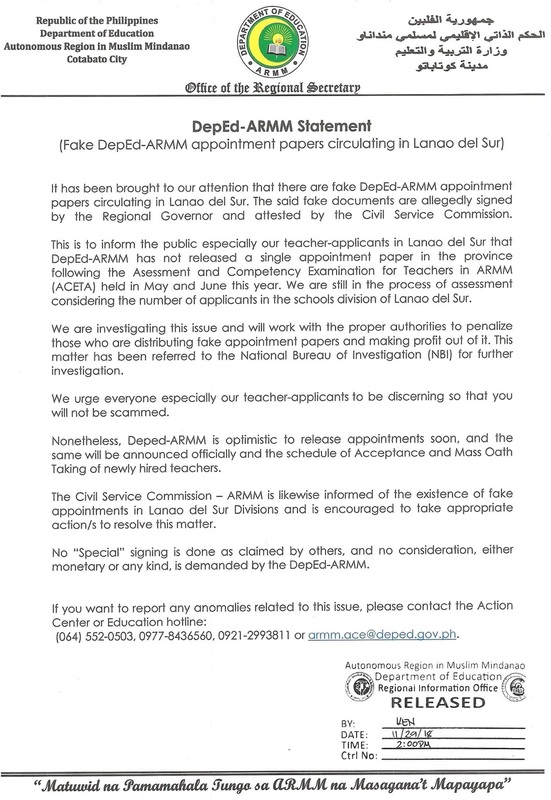 Please see Memorandum Circular No. 040 Series of 20187 for further details. Pathways Offers Financial Grant to Schools in ARMM. 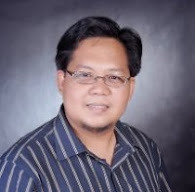 The DepED ARMM Secretary, Atty. Rasol Y. Mitmug, Jr., encourages all heads of both public and private schools to avail the Responsive Innovation Fund (RIF) under AusAid through Education Pathways to Peace in Mindanao (Pathways). 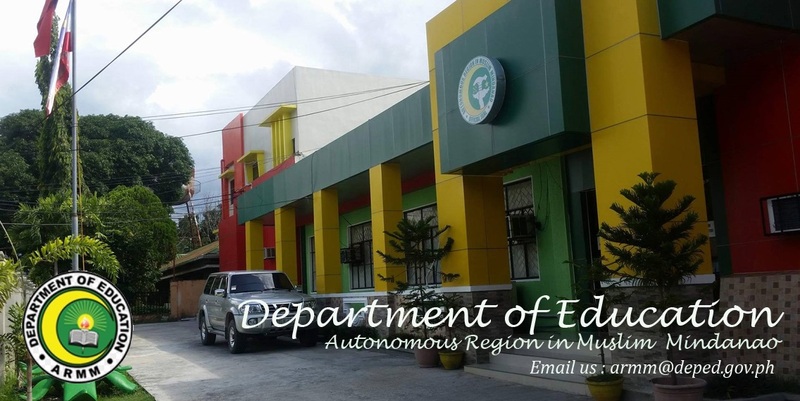 The RIF is a grant facility of the Autonomous Region in Muslim Mindanao (ARMM) through the Pathways Program to provide opportunities for stakeholders to support the delivery of quality education services as well as contribute to peace-building in the ARMM. Pathways aims to lessen disparity and improve performance indicators in school, to be at par in other regions in the country particularly those schools located in Geographical Isolated Disadvantage Areas (GIDA). The program aims to create sustainable opportunities for key actors and stakeholders to work together in providing and supporting conflict-sensitive quality basic education services. 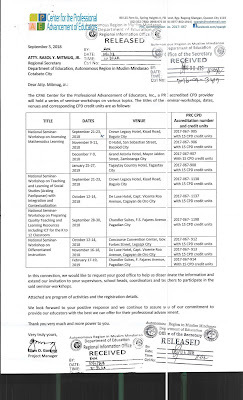 The Center for the Professional Advancement of Educators, Inc., a PRC accredited CPD provider, will hold a series of seminar-workshops on various topics. 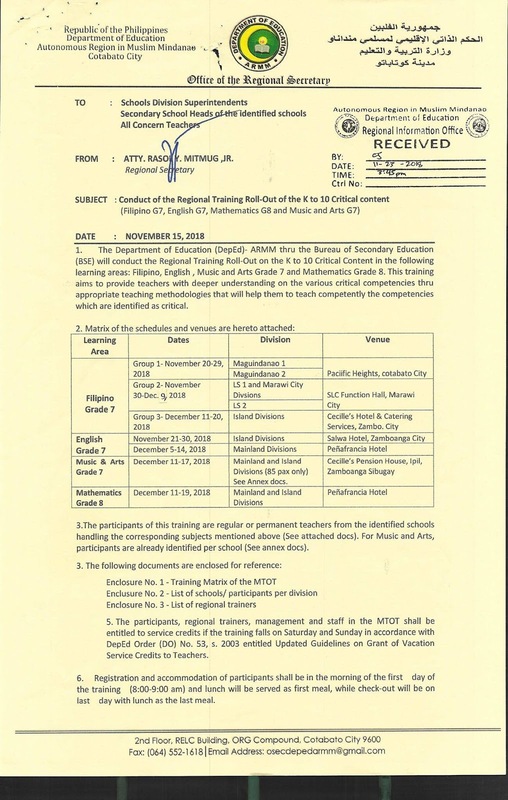 Supervisors, school heads, coordinators, and teachers are encouraged to participate in the seminar-workshops. 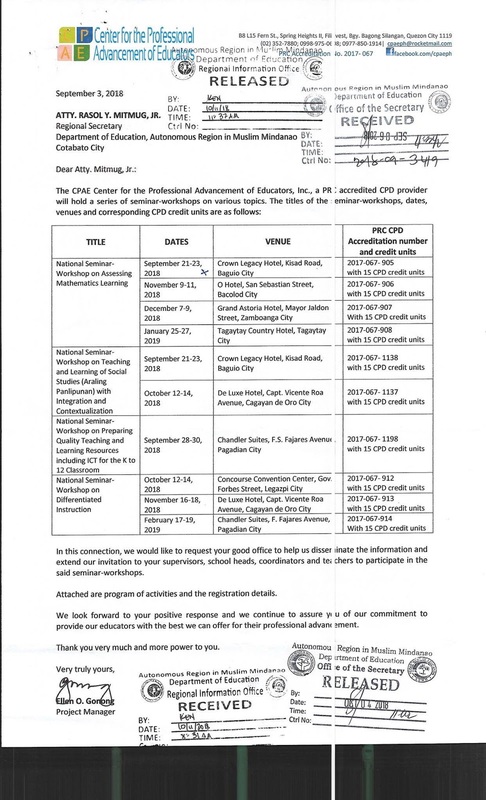 Please see attached communication letter for the titles of the seminar-workshops, dates, venues, corresponding CPD credit units, and other details. 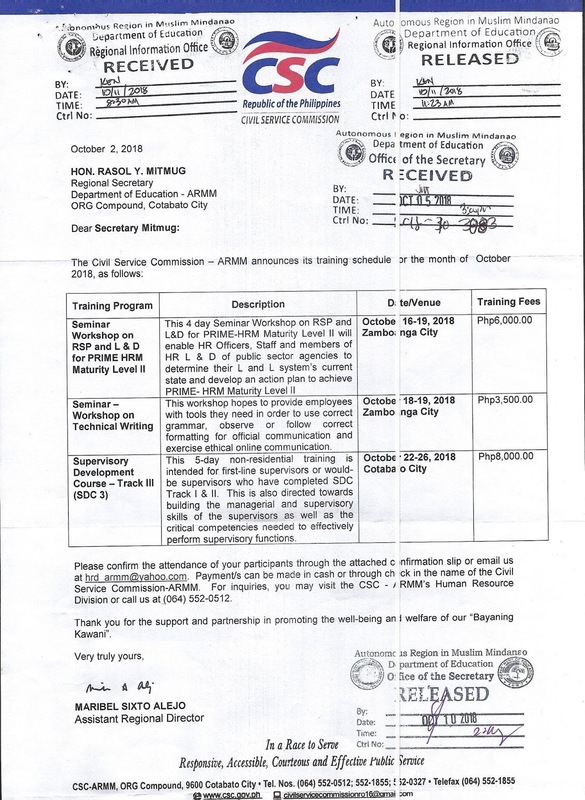 For the month of October, the Civil Service Commission - ARMM will conduct training programs such as the Seminar Workshop on RSP and L&D for PRIME HRM Maturity Level II, Seminar-Workshop on Technical Writing, and Supervisory Development Course- Track III. 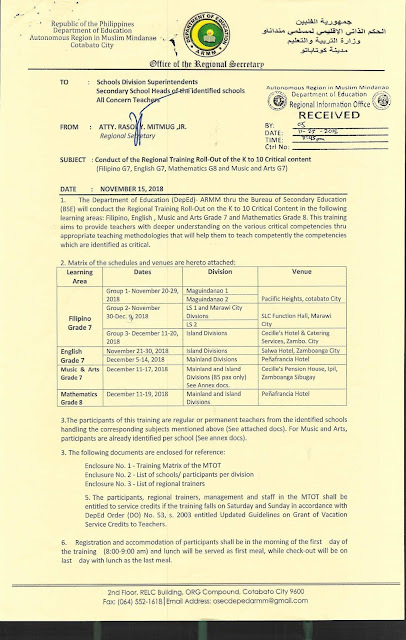 Please see the attached communication letter for the schedule, venue, and other details of the said training programs. 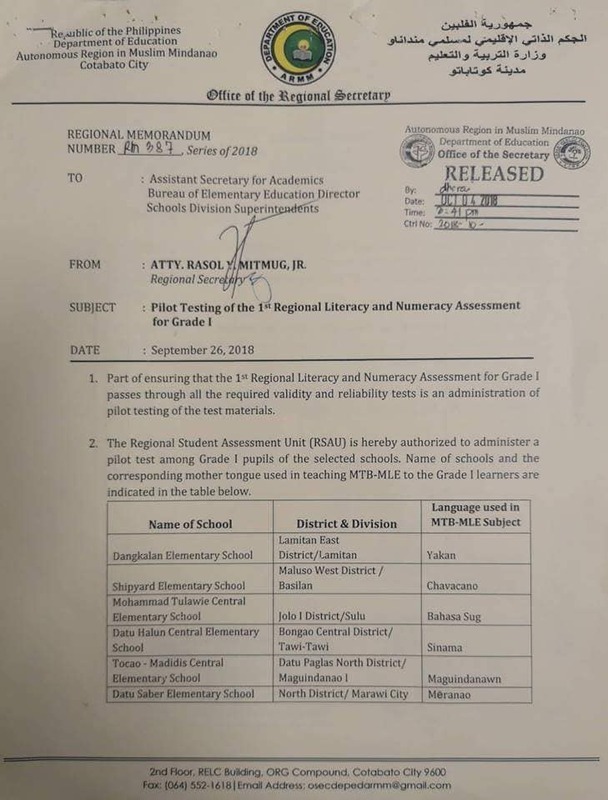 Part of ensuring that the 1st Regional Literacy and Numeracy Assessment for Grade 1 passes through all the required validity and reliability tests is an administration of pilot testing of the test materials. 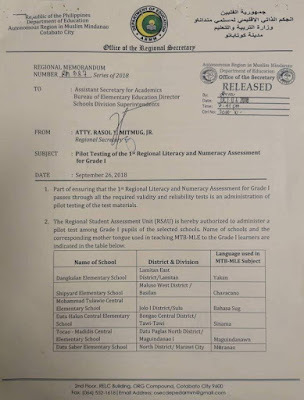 The Regional Student Assessment Unit (RSAU) is hereby authorized to administer a pilot test among Grade 1 pupils of the selected schools. 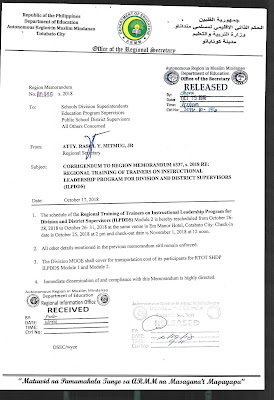 Please see Regional Memorandum No. 387 Series of 2018 for further details.